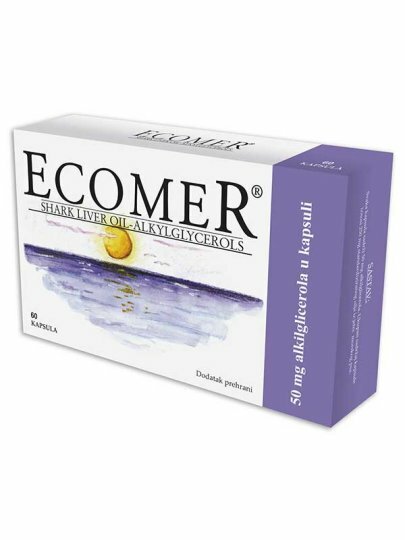 ECOMER® product comprising a combination of the most potent alkilglicerola from shark liver oil from cold sea. ECOMER® is a unique and standardized product formulated and manufactured in Sweden as the fruit of many years of scientific research. sea liver oil standardized to minimum 20% of alkyl glycerol, gelatin, moisture retention agent: glycerol, purified water. It is recommended to take 1-2 capsules 2-3 times a day. Warning: contains an ingredient FISH. Notes: Keep away from the reach of small children. Recommended daily doses should not be exceeded. A dietary supplement is not a substitute or replacement for a balanced diet. It is important to add it to a varied and balanced diet and a healthy lifestyle. Storage conditions: In a dry and dark place at a temperature of up to 25 ° C.
Best to use end to end: Wrapped on packaging (month, year, LOT).